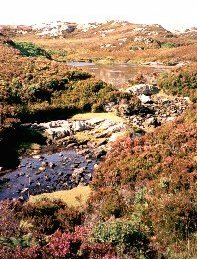 The name of the island means 'Mountain of the Fords' and Benbecula is sandwiched between North and South Uist, now all interconnected by stone causeways. In days gone by these islands were separate and crossing were made over the mudflats only at low tide. The island has some lovely sandy beaches, including a long stretch just below the airport runway. The island's economy is probably somewhat dependent on the airport and military base at Balivanich. Partly as a result of this, Benbecula is home to 1300 people which makes it relatively densely populated. Due to its central location in the island chain, it is an ideal base if you wish to spend several days or a week exploring North and South Uist. Local transport includes planes, buses, ferries, car hire. All sorts of tours are available whether you want to go hiking or cycling (alone, with friends or in a group), or travel on a guided coach trip. Click here for local travel details and info on how to reach the islands. The Heb - Race on the Edge (an accessible multi-discipline Adventure Race Solos and Pairs) will be held over 2 days from 31 August to 1 September 2019. Participants will be biking, running and kayaking up and down North Uist, Benbecula and South Uist. See photos and latest info on Facebook. Eilean Dorcha Festival - Benbecula's annual family friendly music festival is on 26 - 28 July 2019. The administrative centre of these islands. In terms of population and commerce, it is probably second only to Stornoway, the capital of the Western Isles. Its size is due to the presence of the base which supports the military rocket range. Facilities in the town include garage, car hire, general stores, bakery, post office, Bank of Scotland, etc. It is also home to Benbecula airport which has regular flights to and from Stornoway, Barra and Glasgow. Local service buses and the Postbus run from here north to Lochmaddy and south to Lochboisdale. The Stepping Stone is just opposite the airport entrance and is a nice place to eat. This bright, nicely decorated building with wooden interior houses the Food Base (an informal cafe area where you can get snacks and meals such as scampi/fish and chips) and on the slightly raised level is the licenced restaurant, Sinteag, which is more expensive. Phone 01870 603377. For grocery shopping try MacLennans supermarket (tel: 01870 602308) or MacGillivrays Souvenir and Gift Shop (tel: 01870 602525). The Uist Community Riding School is at Balivanich. Tel: 01870 602808. Medieval chapel and burial ground (map reference NF 766537) on the left-hand side of the road when you are travelling southwards after Balivanich. Nunton Steadings is a visitor centre which includes a museum, art gallery, cafe, function room, and a shop selling local produce and crafts. Internet access is available. It hosts a variety of events including historical exhibitions and music concerts. Open daily Monday - Saturday. Tel: 01870 603774. Borve (Buirgh in Gaelic) Castle is a tower-house or hall-house, which was built in the 14th century. At this time, the owners of Benbecula were the Clan Ranald and it is thought that Borve was owned by Ranald, son of John of Islay in the 1370s. It was also owned by another Ranald (known as Ranald of Castellborf) in 1625. Now in ruins, it is located 150 metres from the B892 road visible between 2 houses near Lionacleit. The remains can be seen of a rectangular structure measuring around 15 x 12 metres with very thick walls. The Community School houses an exhibition area next to the library. There is also a swimming pool and theatre. Regular exhibitions are held at the school. This hill on Benbecula is not to be confused with the one of the same name on South Uist! There is a walk skirting around the south side of this Rueval following the track to Rossinish which Bonnie Prince Charlie is said to have taken with Flora MacDonald. You will see a brown tourist signpost on the main road in the middle of Benbecula. This small side road initially leads to the local refuse tip, where you can park your vehicle. From there you can go on a 7-8 mile track there and back, eventually reaching the indented coastline. Along the way, after going past Rueval, the path climbs and you have good views over the islands all around you. The photo of Eaval at the top of this page was taken from here. I have walked this track in September and the heather was superb. We saw some of the many swans which inhabit the lochs of the Uists. There is a range of hotels, B&B and self-catering accommodation available on the islands. The ones listed in the tourist brochure are now given on the official Western Isles Tourist Board web site. Well recomended is the Borve Guest House at 5 Torlum, Benbecula, run by Mrs Gretta Campbell (Tel. 01870 602 685 / Fax: 01870 603 235). 3 ensuite bedrooms. Scottish Tourist Board 4 Stars. Open all year. Lionacleit Self Catering is situated on a 24-acre croft on Benbecula. Choice of 3 self catering units: Am Bothan (4 adults, 2 children), Smiddy Steadings (4 adults) and The Chalet (2 adults). Tel: 01870 602176. Uist Cottages have 2 self catering properties on Benbecula. 1 Grimsay Island sleeps 2 and 3 Kyles Flodda sleeps 4. Hillview Holiday Cottage (sleeps 4-6 people) has panoramic views and is less than 3 miles from Culla beach on Benbecula. Situated 30 minutes drive from Lochmaddy ferry terminal and 40 minutes from Lochboisdale ferry terminal. Contact Ann & Archie MacLeod. Tel: 01878 700862. Nunton House Hostel is in the converted 18th century former home of the clan chief of Clan Ranald. Situated just over 1 mile from Balivanich. First opened in May 2012. Accommodation in 4 en-suite dorm rooms each with 4 beds (2 mixed, 1 male, 1 female). Tel: 01870 602017 / 01870 603727. The Shellbay Caravan and Camping Park at Lionacleit can accommodate up to 15 caravans / motorhomes and 15 tents. April-October only. Tel. 01870 602447.